The Colorado Avalanche are back in the playoff contention. The Colorado Avalanche have gone from the worst team in the National Hockey League (NHL) to the top eight in the Western Conference. The 2016-2017 season marked one of the Avalanche’s toughest years, finishing with fewest amount of points scored since moving to Denver from Quebec in 1995. Since last season, many changes have been made by General Manager and former player Joe Sakic. These alterations have proven to be successful, as shown by the team’s current occupation of a wild card spot. A major improvement can be attributed to Assistant Captain and Centerman Nathan MacKinnon. MacKinnon has played in the NHL since 2013, when he was drafted by the Avalanche, but this year has proven to be his best season yet. He is a leader in the MVP race, and has been nominated for the Hart Trophy, which is awarded annually to the player judged most valuable to his team. After the trade of former Centerman Matt Duchene, MacKinnon moved up to the Avalanche’s top line, accompanied by left wing and Captain Gabriel Landeskog and right wing Mikko Rantanen. MacKinnon earned a 14 game point streak, and has acquired 97 points in his 74 games played this season, with 39 goals and 58 assists. He is also ranked second in the NHL for points per game, scoring 1.31. This year’s new success can also be attributed to improved defensive skills. Leading defenders Erik Johnson and Tyson Barrie have played their best seasons yet. Johnson has already beat his personal best for shots on goal, with 157 this season. Earlier this season, Johnson was out of play for almost a month due to a shoulder injury. He experienced another injury, a fractured patella, only a few weeks after his return, taking him out for the remainder of the season. Johnson is a cornerstone defenseman for the Avalanche, and his injuries did not stop him from beating many personal records. Barrie has also shown improvements, with 56 points in 67 games played, ranking him in tenth place for most points by a defender in the NHL. Additionally, Barrie has accomplished an 11 game point streak: the longest by a defenseman in Avalanche history. The team’s starting goaltender, Semyon Varlamov, experienced an injury early in the season, allowing riding backup goalie Jonathan Bernier to build up a 91 percent save average in 36 games played. During the faceoff against the Chicago Blackhawks on March 30th, Varlamov experienced a lower body injury which forced him to miss the rest of the season. As a result of Varlamov’s injury, Bernier stepped back up to the starting position. “You’ve got to focus on the process and just play your game,” Bernier told The Denver Post. Both goalies have similar records, with Varlamov earning a 92 percent save average, but the injury of this strong player is a huge let down for the team. The Colorado Avalanche have not qualified for the playoffs since the 2013-2014 season, when they lost in the first round to the Minnesota Wild, thus putting the team on edge to qualify this year. “We just have to dig deep and work hard. We’re as hard on ourselves as anybody is. We’re expecting a lot out of ourselves but I know we’re going to come through and score some big ones,” mentioned Landeskog. The team was not guaranteed a playoff position until their final game of the regular season, with a 5-2 victory over the St. Louis Blues. The Avalanche are set to play the Nashville Predators in the first round of the playoffs, starting on April 12th. 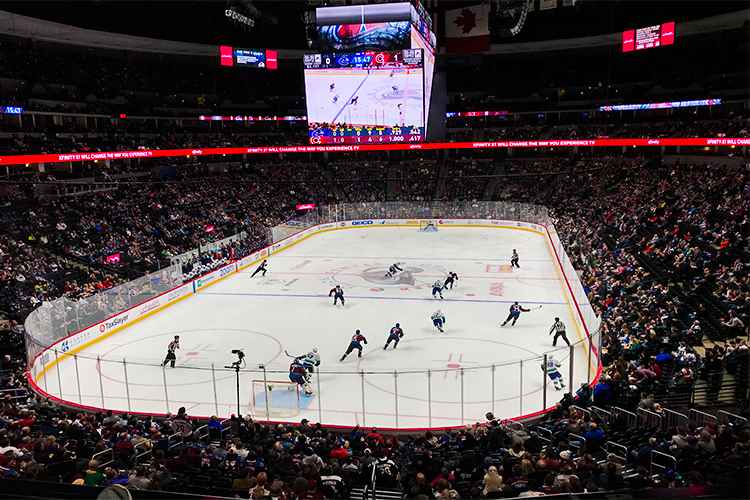 The many improvements this season have allowed the team to return to the contention and hopes are high that the Avalanche will only continue to compete in the playoffs in the future.